Combine the mango, jicama and lime juice in a bowl; season with salt & pepper to taste. Pat your tuna dry and then cut the loin into 2-inch x 2-inch square segments the length of the loin (or shorter based on your pan size) for appetizer-size portions, or larger for entree portions. Season with salt and pepper and then roll the tuna in white sesame seeds coating as much of the loin as is possible. Heat your pan (we love cast iron skillets, but a non-stick will work as well) for a few minutes until scorching hot. Drizzle oil in the pan and sear each side for 30-45 seconds; then set aside. 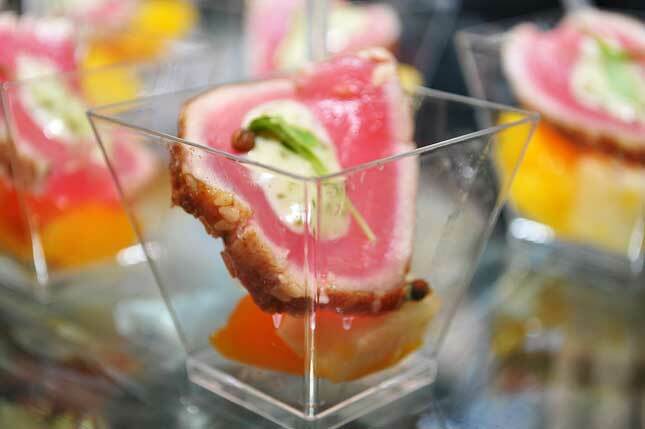 We like the center raw, not rare, raw which requires only the best sushi grade tuna available. (At this point you can either slice and serve your tuna, or wrap it up tightly where it will hold in a fridge for up to 36 hours. When ready to serve, slice the tuna against the grain and present over the mango & jicama salad. Garnish with a smoked garlic aioli (or a spicy mayonnaise) and top with cilantro.